Basic wall-mounted panel fitted with a library of 7 aids to stimulate everyday domestic activities or everyday dressing activities. Panels for wall-mounting, which can be configured and are of various types. These panels can be fitted with the most useful aids in each case, chosen from the theme libraries available. Library of work aids for insert and graps at different skill levels. Library of work aids from the magic snake range at different skill levels. Library of work aids for manipulation skills at different skill levels. Library of work aids for domestic activities at different skill levels. Library of work aids for clothing and food at different skill levels. 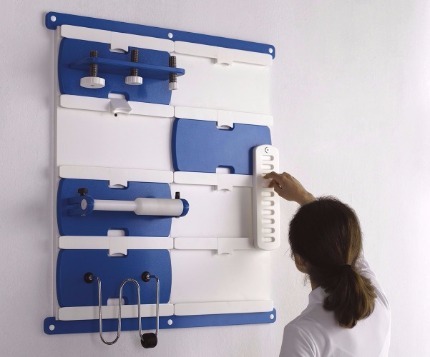 Modular aids made by a hole base and a series of different modules combined together, allowing multiple configurations and exercises for the professional. Ergo Mobile Station is a metal structure designed to be used as a place for keeping the various aids. It is also intended to be used as a mobile work station. 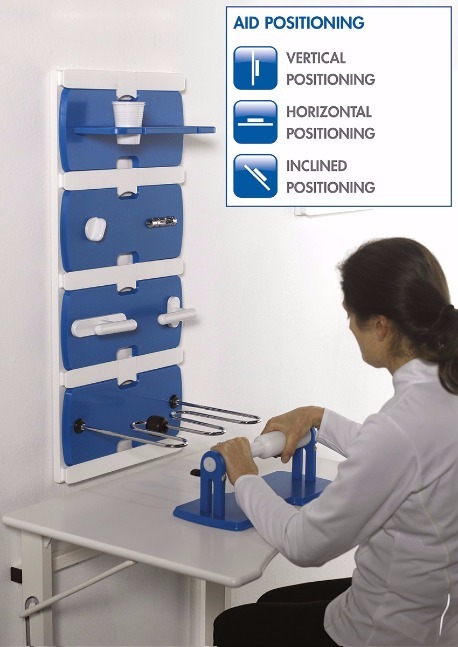 The use of position feedback instruments makes it possible to draw the patient’s attention to the motorial behaviour of areas of their body, focussing attention on important aspects of the gesture. Occupational tables with a variety of adjustment options to suit all users. 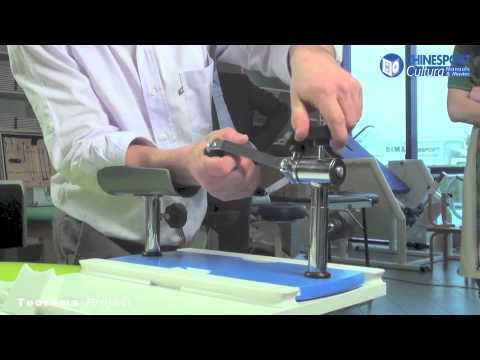 Instruments that offers numerous features for standard screening, and for evaluating hand traumas and pathologies. "The main objective of occupational therapy is enable people to TAKE PART in everyday activities to the best of their abilities. Therapists guide patients in identifying those activities that are more difficult for them and finding possible solutions, using objects or strategies to compensate for or modify the activity. Upper limbs are extremely complex and represent one of the bigger challenges in rehabilitation, whether due to infantile cerebral palsy, Klumpke paralysis or any articular limitations caused by chronic inflammatory process such as in cases of rheumatoid arthritis and/or fibromyalgia. Even a simple periarthritis or tendonitis can be the cause of significant limitation in everyday activities. The number of even relatively young individuals affected by hemiparesis following a stroke is on the rise, as are demyelinating diseases and cases of multiple sclerosis, with all the issues deriving from having an abnormal control of the limbs. In order to improve the patient’s quality of life as well as for those who care for him/her daily, therapy efforts must try to achieve the highest results. To this end, the therapist needs a series of objects to both test patient’s capabilities and difficulties in performing various actions, and to progressively train him/her to overcome them. It may be necessary to repeat the same exercise several times to obtain meaningful results, so significant help comes from having an availability of tools that can be used without the constant presence of a professional. Reduced time and space, combined with a lack of suitable equipment that is easy to use, is a frequent cause for frustration both among patients and carers, and dramatically reduces the chances of recovery. 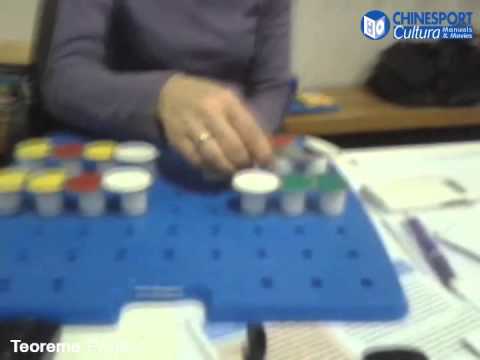 Often an experience of unsuccessful attempts at using everyday objects or games stops any other further attempt, limits the acquisition of new skills and reduces the possibility of self-sufficient activities, increasing the need for assisted care. A patient starting occupational therapy expects an exercise and training programme, with an active role in therapy, and often expects to recover that function. For patients who have not yet had the chance of processing a trauma, as is the case after a stroke, it may be difficult to have a sense of reality regarding the damage. This is true for both limitations and residual capabilities." "For a patient, it is difficult to understand the possible “adaptations” and compensations. Motivation is greatly increased when treatment occurs in an environment containing a wide range of equipment that physically tests every residual movement, even when limbs are severely affected. For example, making a patient aware of what type of grasp they are using or how they are able to bend or extend their elbow or wrist, or to what extent they are able to move their shoulder, is key to create a strong, comprehensive treatment and to set up a range of exercises that PREPARE them to re-gain independence when using various objects that are useful for home, work and spare time. Using “neutral” objects and materials that are removed from any emotional significance because they are either non-personal or non-evocative, is more likely to push you into testing yourself, experiencing satisfaction at every small progress. 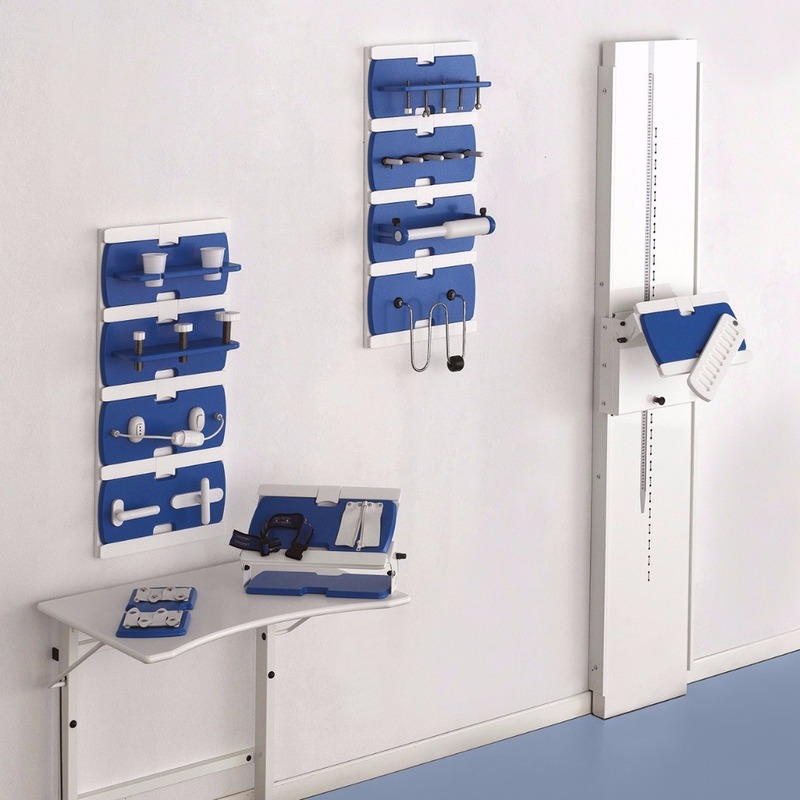 These modular aids can also be used in limited areas and suit every need, enabling an accurate evaluation and to achieve gratifying results for both the therapist and patients, whether they are children, adults or elderly, whether they suffer from musculoskeletal or neurological limitations or affected by attention deficit disorders or intellectual disorders. Seeing how an upper limb can recover its capabilities and be used to gain more independence in everyday tasks, even after a trauma, neurological condition, arthritis, arthrosis or stroke, improves the patient’s general well-being and brings joy to family members and therapists too. It is in this context that, after many years of effort in rehabilitating patients suffering from complex conditions and multiple disabilities, we have further extended our Teorema programme with the critical contribution from patients and their families." A series of work aids is proposed that are used to simulate different activities in daily life. These aids have been grouped into various libraries - “Grasp and Insert”, “Magic Snake”, “Manipulation Skills”, “Domestic Activities”, “Clothing”, and “Food”. A series of icons is used, along with the presentation of each individual aid, to facilitate which library it belongs to, as well as other specific attributes.The base modules used to attach the aids are made from highly resistant, anti-bacterial materials of the highest quality, made to last over time without any alteration; in particular, they are resistant to water and UV rays and can be easily disinfected. Joining of two ERGO 100 panels (ref. code AR10003) using the joining set (ref. code AR10005). Using two panels in line with one another can make it possible to move the individual work modules sideways, by sliding them in the guides, without removing them from the wall. 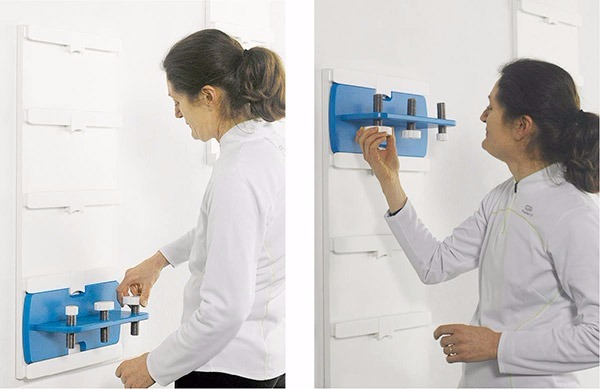 Modularity comes into its own with the variety of solutions proposed for executing occupational exercises, which can be done in a standing position or seated. Also panels are offered for wall-mounting, which can be configured and are of various types. These panels can be fitted with the most useful aids in each case, chosen from the theme libraries available. Using the same space for the wall panel it is therefore possible to vary the therapeutic exercises the patient is to carry out. Minimal time is required for the therapist to set up the panel, and no tools are required. The presentation below for each aid includes information in the form of an icon that indicates whether the aid can be positioned vertically, horizontally, or at an angle. This results from the need to provide the patient with the possibility of making the exercise better suited to their limitations. Once the aid to be worked with has been identified, it can be positioned at the correct height. Once the aid to be worked with has been identified, it can be positioned at the correct height. The possibility of positioning the individual work aid higher up brings gradualness and progression to the exercise, as the patient improves. 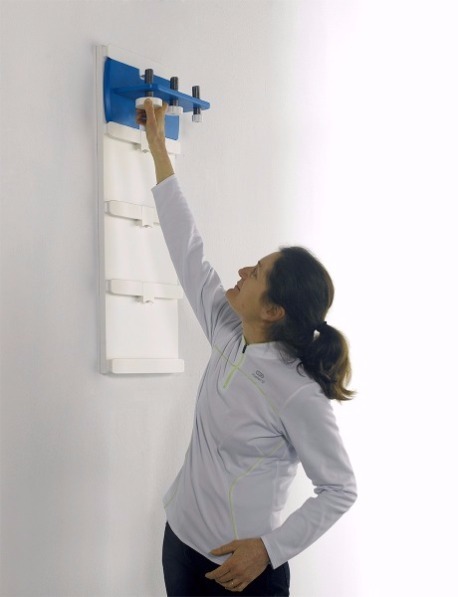 Also, the same work aid can be used in a horizontal position or inclined between 0° and 90°.